Wondering what Control Techniques Unidrive SP Drives are actually used for? Well here’s a pretty cool application for those of you that enjoy theme parks. This zero-gravity ride at the Walibi Theme Park in Belgium was recently refurbished using Unidrive SP Drives. Previously, the ride had been using Unidrive Classic Drives to run the motors which hoisted riders over 250 feet in the air. 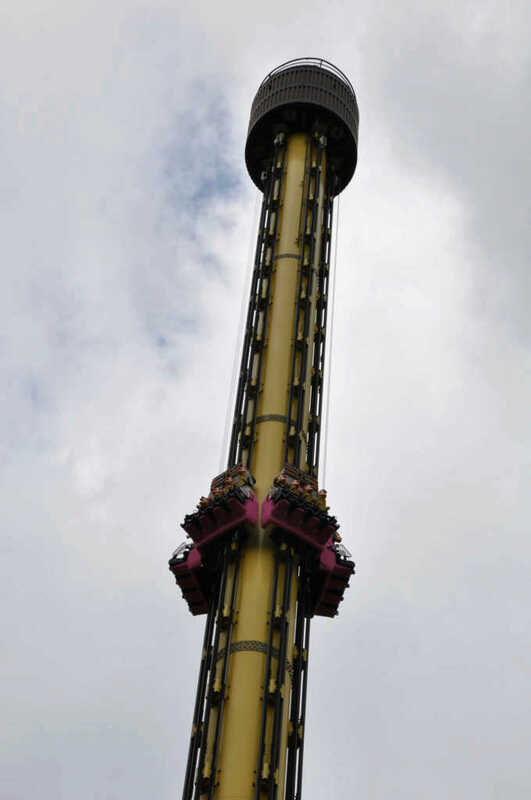 The drop tower is based at the Walibi theme park; the ride is a round tower of 77m in height and has five rows of seats, each with four-person capacity, in a ring around the tower. The seats, weighing 1.5 tonnes empty, are hoisted by speed-controlled Leroy Somer geared motors to the top of the tower, where they are released to drop in freefall at a maximum speed of 110km/hr, generating complete weightlessness. Magnetic current brakes that comprise permanent magnets fitted in the seats generating powerful Foucault currents in the metallic frame of the tower provide fault-free guaranteed braking, independent of the power supply, bringing the ride to a safe slow speed with hydraulic shock absorbers providing the final soft stop at the base. This, Control Techniques said, makes the ride a ’zero-risk’ attraction. The Dalton Terror was originally installed in the park in 1998 and featured the previous Classic Unidrives to haul the seats to the top of the tower. Compagnie des Alpes has been investing heavily in the upgrading of many of the rides, with the accent heavily on safety. When it decided to refurbish the Dalton Terror, the precise movement of speed profile of the previous Control Techniques drives was a key factor in the selection of the latest-generation of AC drives and five heavy-duty 75kW Unidrive SPs, operating in closed-loop flux vector mode, were fitted as part of the total renewal of the control panels. Signals from encoders fitted to each of the Leroy Somer LSMV motors feed back to the drives and, using SM Universal Encoder Plus option modules, are re-transmitted to the PLCs that control the safety of the whole process. Modicon PLC Unity Pro Software upgrades are becoming increasingly popular for MRO Electric customers. We find ourselves quoting the software often, but before we can give you a price we need to know which version of the software is necessary for your purposes. That’s why we’ve created this blog post – the table below shows all the variations of part numbers for Unity Pro. Just find your part number and include it in your RFQ… we’ll have a price back to you in no time. Some common questions are answered at the bottom of this post. Faults What happens when a fault occurs? - Status signal ZSW1.3 is set. - The fault is entered in the fault buffer. Alarms What happens when an alarm occurs? - Status signal ZSW1.7 is set. - Alarms are "Self Acknowledging" meaning they are reset when the cause of the alarm has been eliminated. The Easy mode macro for Unidrive classic gives the simplest operation of the drive for basic applications. It is identical to the default condition except that menu 0 has fewer parameters. The Motorised potentiometer macro enables the drive’s own internal motorized potentiometer to control the speed of the drive via digital inputs. A digital input selects between an analog speed reference and the motorized potentiometer reference. The Preset reference Unidrive macro enables the use of preset references to control the speed of the motor via digital inputs. A digital input selects between an analog speed reference and the present references. The Torque control macro configures the drive for use in Torque control mode, selectable via a digital input. Analog input 1 is configured for the torque reference. When in speed control analog 2 is the speed reference. When in torque control with the drive in closed loop mode analog input 2 is the speed override reference. Enabling torque mode with the drive-in open loop mode will put the drive into pure torque control. In closed loop mode, the drive will be put into torque control with speed override. The PID control macro enables the drive’s own internal PID controller to control the speed of the motor. Analog input 1 is configured for the main speed reference, analog input 2 is the PID reference and analog input 3 is the PID feedback. A digital input selects between an analog speed reference and the PID control. The Axis limit control macro configures the drive for use with limit switches so that the drive is stopped when a position limit has been reached. The speed reference can be either unipolar or bipolar. The brake control macro configures the drive to apply or release a mechanical brake on a motor in a crane or hoist application. The drive issues a brake release signal via a digital output when the relevant conditions are met. ^Only available in closed loop vector or servo operating modes. The drive operates as a slave in a closed loop master-slave system. The slave motor is digitally locked to the master motor. The motor speed is controlled in the same way as for default operation, but the motor shaft can be orientated to a specified angular position before and/or after running the motor. 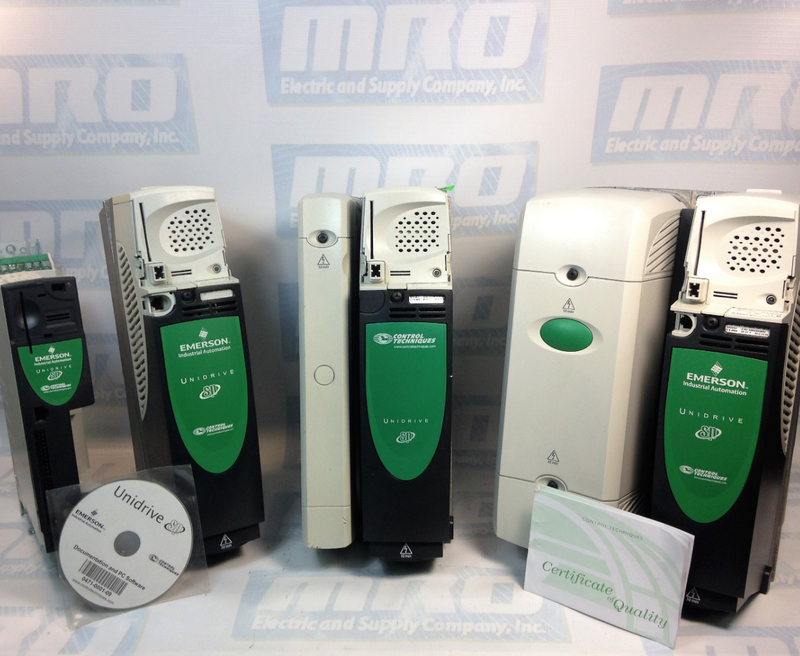 MRO Electric and Supply has new and refurbished Control Techniques parts available including Control Techniques Unidrive and Unidrive SP series. We also offer repair pricing. For more information, please call 800-691-8511 or email sales@mroelectric.com.